Are you wondering how to make puff pastry? While there are very good frozen puff pastries available in the freezer section of most grocery stores, homemade puff pasty can make that special occasion even more special. Recently, a number of new methods for making puff pastry have arisen that take much of the hard work and time out of the equation. Making a classic puff pastry involves a flour and water dough, butter, lots of rolling, precise measurements, precise temperature conditions and about three days of your time. Fortunately, creative and adventurous cooks have learned how to make puff pastry using simpler methods, and more importantly less time! Work on a cold surface, such as a cold marble countertop or marble board. It is necessary to keep the butter that you are using in your recipe cold. This is because the butter melts in cooking and leaves the air pockets that make puff pastry puffy. If, at any time, the butter begins to soften, pop the dough in the freezer for 10 to 15 minutes to firm it back up. Melting butter will ruin your efforts when you're making puff pastry. If you like your puff pastry to have a glossy sheen after it is baked, you may brush it with an egg wash prior to baking. Puff pastry can be made in big batches and frozen. To freeze, wrap tightly with plastic and then foil, and freeze for up to three months. While the methods in this article showing how to make puff pastry are easier than the traditional method, there is still some difficulty involved. If you try making puff pastry a few times with poor results, there is no shame in purchasing the frozen pastry available in your grocery store freezer section. As with any pastry, puff pastry does best with minimal handling. 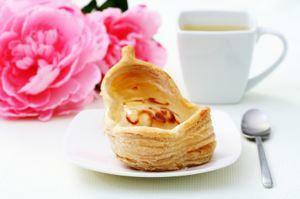 The more you handle the pastry, the more you sacrifice flakiness and tenderness. Using a coarse grater, grate the frozen butter into the bowl with the salt and flour and mix gently. No need to incorporate the butter and flour together at this point - just gently toss the ingredients together. Mix all of the ingredients together using a fork or a whisk. Gather the dough and turn it out onto a floured work surface. Using the heel of your hand, press down onto the surface. Don't knead. Just use your hands to press and spread so that the butter is more incorporated into the flour. Pat the dough into a ball. Wrap it with plastic and freeze for 20 minutes. Roll the dough on a floured surface into a rectangle that is 1/2 inch thick. Fold the dough into thirds, and then fold that in half. Repeat the folding and rolling one more time. Fold the dough as directed above, wrap it in plastic, and freeze the dough for another 20 minutes. Repeat two more cycles of rolling, folding and freezing. Now the dough can be used just as you would any other puff pastry. The second method is an interesting one that utilizes yeast to make the puff pastry dough. While yeast is not a traditional ingredient of puff pastry, it may be well worth trying if you are looking to save some steps and make a quick puff pastry in an afternoon. The method can be found at How to Cook Like Your Grandmother. As you can see, making and using puff pastry for all of your recipes that call for puff pastry doesn't need to be a complicated, multiple day process. Give the two methods above a try. You might discover that you are far better at making puff pastry than you ever could have believed.